Planning and Scheduling is a key component of the Plex Manufacturing Cloud to enable production resource planning that extends into finite scheduling and ultimately digital production dispatch of jobs down to your workcenters. Production Resource Planning makes creating jobs for forecasts or customer releases easy and efficient. Finite Scheduling helps you manage the finite resources of material, equipment capacity and other resource constraints. And because Planning and Scheduling is an integral part of Plex, Production Dispatch keeps jobs linked to the control panel for dynamic job management. The Production Requirements Planning screen provides a wealth of information including up to date inventory counts, customer orders, future forecasts and scheduled jobs. The planner can quickly process exceptions where part-inventory will be deficient to meet customer demand, or where part-inventory will be in excess. Here the net row, displayed in red, suggests a deficiency and recommendation to take action, meaning “schedule a job for 1,100 parts”. By adding a job for the correct quantity and time, we’ll avoid any inventory stock-outs and missed customer shipments. Additionally, optimal quantities can be set up to run minimum or standard job runs. The real-time integrated view of finished goods or work-in-progress inventories can be further validated to see if they have been produced or if they’re available in the Finished Goods warehouse Visualizing the live job dispatch is just a click away by using the action bar to check on the progress and see if you’re running on time. Lastly, the flexibility to regenerate M-R-P on demand or adjust the regeneration schedule is available through the M-R-P admin action. Production jobs that are scheduled, need to account for constraints, such as lack of material, people or machine capacity and priorities, such as urgent customer requests. The finite scheduling engine can take a group of production jobs, consider the constraints and priorities, and create a realistic and optimized schedule that will ensure you are able to meet your customer’s delivery requirements. If production jobs will be late, Gantt charting can provide a quick visual of what jobs will be affected. For example, by selecting a different planning scenario, you can increase a workcenter’s capacity to 3 shifts. Organizing a production schedule to reduce setup time is critical. By including product attributes, a planner can group jobs in sequence by like-raw-materials, allergens, packaging or tooling installed on a machine. Simple drag and drop scheduling allows operation sequencing. Once the schedule has been pinned or frozen it cannot be undone. Applying your user-defined business rules--such as grouping all jobs of like material--is accomplished by applying a ‘sort rule’. The grouped and sequenced jobs can then be sent to the floor for production. You can investigate delays using delay-reports to uncover the cause, such as an over-capacity workcenter, no raw material or an unavailable key resource. 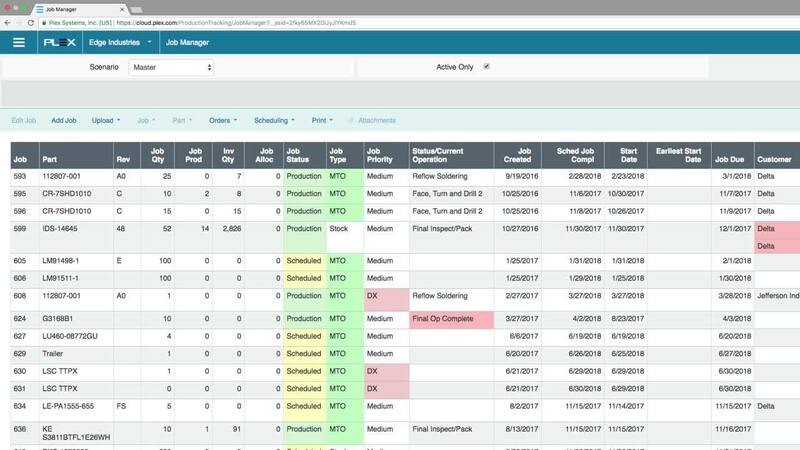 The Control Panel is directly linked to the production schedule or dispatch-list so production operators know what jobs to work on, and in what order. Configurable controls can secure the schedule and will not allow operators to jump ahead of the production sequence prescribed by the scheduler. Alternative scheduling methods are available, such as Kahnbahn cards. Kahnbahn, is a widely known lean scheduling technique that utilizes a visual card system, also known as pull-scheduling. A digital Kahnbahn card system can be setup and automatically tied into current on-hand inventory inside the kahnbahn loop. This visualization eliminates the need for physical kahnbahn cards and relieves the burden from schedulers so that operators can work autonomously. As inventory is produced, Kanban cards are ‘digitally’ removed from the rack and assigned an inventory license plate, or serial number. When inventory is shipped or consumed, the Kanban cards are ‘digitally’ replaced into the rack. This will visually queue the operator to produce more of this product. Planning and Scheduling is a critical component of the Plex Manufacturing Cloud, linking your dynamic production resource plan with finite scheduling and production dispatch to suit many different planning scenarios.